What's going on in Flaxmere? Rick Barker claims there is no-one on the dole in Flaxmere, but nobody believes him. Officially there were 6 people on the dole at the end of March 2007. And according to Work and Income's general manager of national operations, Janine Dowding, Other benefit statistics for Flaxmere were also good, she said. There are 1283 people registered on benefits at the Flaxmere office. Since 2002, Flaxmere has managed to reduce its total beneficiary caseload by a mere 156. It is by far the worst performing office in the region. In the past year DPB numbers have gone up, against the national trend. 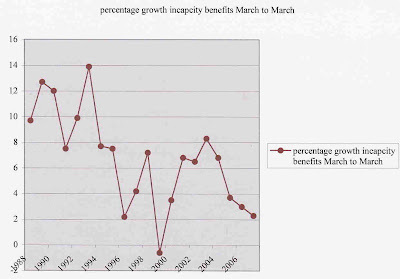 In the past five years, sickness benefits are up 39 percent and invalid's 8 percent. Work and Income's general manager of national operations employs a very generous definition of "good". What Is A “Human Right”? In essence, a rights-based approach to policy is one that ensures that policy is formulated within the parameters set by New Zealand’s human rights obligations, as found in domestic and international law. Before examining that body of law, however, it is helpful to think more generally about what is meant by a “human right” and, in particular, how a focus on “rights” might differ conceptually from, for example, the focus on “needs” that is invited by the yardstick of “wellbeing”. Needs-based and rights-based approaches inevitably have much in common. However, the language of “rights” emphasises particular dimensions of the interests, entitlements and duties that are at stake. Thus we say that “John needs food” if we believe that in the absence of food, John’s wellbeing will suffer in some way that we regard as fundamental. We are identifying the predicament (neediness) that John will face if deprived of food (Waldron 1996:105). A similar assessment of John’s neediness may well also underlie the statement “John has a right to food”. The idea of rights, however, complements the idea of neediness in a number of respects. First, the language of “rights” is the language of demand or entitlement. To say that “John needs food” tells us nothing about the moral or legal obligations of others in relation to John’s need. In contrast, the statement “John has a right to food” means that someone else (in the case of international human rights law, the state) has a duty to ensure that John’s right is protected (White and Ladley 2005:6, Waldron 1996:94). This also has implications for how we view the rights-bearer. To say that John “needs” food is to present John as a passive victim and potential recipient of charity. To say that John has a “right” to food is to conceptualise John as a holder of entitlements. The language of rights is thus the language of empowerment. John is cast as a self-sufficient and independent rights-bearer whose assertion of rights amounts to a vindication of his autonomy, personhood and dignity (Waldron 1996:96 and 104). Further, John the autonomous rights-bearer does not have to “earn” his right to food. As a “human right” it is owed to him by virtue of his humanity. The concept of “deserving” and “undeserving” poor is largely absent from human rights thinking. If John was "self-sufficient and independent" he would be "earning" his own blasted food. He is not made "self-sufficient and independent" by law that says other people have an obligation to buy food for him. Or clothes or cars or Ipods. Is it any wonder this country is replete with whingers and moaners who think they are owed a living when we fill their heads with this sort of garbage. 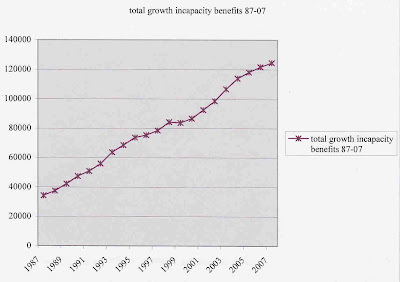 Incapacity benefits are sickness and invalid's combined. The de facto dole in many cases. But never fear. The good news is the rate of growth is slowing "significantly". The percentage growth rate will drop by necessity if the absolute numbers climb at a steady rate, allowing a good news story to be spun from a bad news one. Perhaps you should bear this in mind. In 1953, when the population of New Zealand was half of what it is now, there were only 13,000 people on these benefits and some were there as a consequence of WW11. The increase since has been nearly ten-fold. With improved medical technology and the advent of ACC, who would have predicted it? (Postnote; If you follow my posts regularly you may wonder why I have argued previously that the Minister shouldn't continue to claim the growth rate was reducing. This is because tracking December to December there was an increase during 2006). The Stuff Poll I referred to earlier has swung around. Now a clear majority are saying the amendment is bad law. The Police are calling for 'inconsequential' to be defined (we just go around in circles) and Stephen Franks gives his estimable opinion. What does it take for New Zealand to get a mention in an American newspaper? It has to be about them and it has to be something they can skite about. The LA Times reports that their population has passed the 4 million mark which means their population is now as big as the whole of New Zealand's! Actually, hate to burst their bubble, but, this isn't news. Our populations have mirrored each other's since we began counting them although they started a bit sooner. Transport Safety Minister Harry Duynhoven last night revealed how close he came to crossing the floor over the Bradford bill. Mr Duynhoven is one of Labour's more conservative MPs, and was frequently challenged by National MPs to vote with opponents of the bill. "On this issue I have been more torn than any other issue we have debated in this House," he said. "I have seriously considered whether I fitted still, whether my views and the basis of my value system were appropriate for the party I am in." Personally I don't think he was on his own. But now we will never know. With the amendment we will have the police defining what is acceptable. If they don't want to make that call they can refer the case to CYF. What is CYF's directive? As always they will be using their discretion based on evidence and testimony. So what happens before a case reaches court is pretty much the same. Thereafter, the accused will have no defence of reasonable force and the court will have to decide what is and isn't 'inconsequential'. Things have just become a lot murkier. What was bad legislation has been turned into worse legislation and so it will be passed. There will be more reports because the population, thanks to this extraordinary debate, is charged up about the moral rights and wrongs of smacking. And given the result, it's a debate that has been a waste of time. Except for the CIR petition that asks govt to do something meaningful about child abuse. What does the amendment mean? Taking stock, what do we have now with the Key/Clark amendment? I have no legal knowledge. If a police officer can be persuaded that more than 'inconsequential' force has been used he or she will decide a prosecution is warranted. What happens when the parent arrives in court? There is no longer a defence of reasonable force but can his lawyer then argue that the force used was in fact 'inconsequential' and his client wrongly prosecuted? Can the parent still request a jury trial? Are we back where we started from? Update; From Stuff about the amendment, At the same time it did not define an acceptable level of violence against children, which would have pushed Ms Bradford to withdraw the bill completely. Well, it does. The new acceptable level of violence will be whatever a cop decides is 'inconsequential'. Sweden's ban on smacking, introduced in 1979, has been widely cited by supporters of Sue Bradford's bill as having successfully reduced child abuse. Welfare commentator Lindsay Mitchell is not persuaded. "Sweden's Ministry of Health and Social Affairs continues to express considerable concern about the levels of violence towards children and women. According to Sweden's Strategy Report For Social Protection And Social Inclusion 2006- 2008 the Committee against Child Abuse says around ten percent of all children have at some time experienced this type of violence. Additionally, reported violence against women had climbed 20 percent in recent years." "It is notoriously difficult to gauge levels of child abuse with under-reporting, false reporting, under-diagnosing and under-coding in hospital admissions. In New Zealand CYF found 20,110 instances of abuse in 2006. In the same year 16,173 child clients were receiving CYF services. That number represents approximately 1.9 percent of 0-14 year-olds." "The Christchurch Development Study found that 4 percent of participants had experienced physical abuse by the age of 16 and a study by the Office of the Children's Commissioner found that 10 % of intermediate-aged children had been punched, kicked or beaten by an adult in the previous 12 months." "It would appear that Sweden and New Zealand have comparable rates of child abuse despite Sweden's ban on smacking for the past 28 years." Apparently Cuba has been distorting its life expectancy and infant mortality statistics. Babies who die within 24 hours of birth are sometimes not counted in infant mortality rates and Cuba's abortion rate is 7 in 10 pregnancies. Apparently, Cubans are often pressured into abortions if there is a chance a baby might require extra medical care. Doctors at Yale University in the United States tested the impact of THC on 150 healthy volunteers and 13 people with stable schizophrenia. Nearly half of the healthy subjects experienced psychotic symptoms when given the drug. Though the doctors expected to see marijuana improve the conditions of their schizophrenic subjects - since their patients reported the drug calmed them - they found the reverse was true. The study stopped early because the impact was so pronounced that it would have been unethical to test it on more people with schizophrenia. The rate of growth in inflows was most rapid for Māori and Pacific peoples (41% and 36% respectively, compared with 24% for the New Zealand and other European grouping). It is likely that significant changes in the recording and coding of ethnicity in benefit administration data partly account for this.26 Variations in the rate of population growth or in the rate of population ageing between ethnic groups may also be important. Most of the growth in the number of Māori and Pacific entrants is explained by incapacities other than the five that generated most of the overall growth. * For Māori, this reflects larger contributions from schizophrenia (accounting for 12% of the growth in Māori inflows at ages 15–59), cancer (7%), respiratory (6%), circulatory (5%) and nervous (5%) conditions. * For Pacific peoples, it reflects larger contributions from circulatory conditions (accounting for 23% of the growth in Pacific inflows at ages 15–59), endocrine conditions (17%) and cancer (10%). Interestingly there was no growth in inflows due to schizophrenia for NZ and other European yet it isn't just Maori using marijuana. There is something else predisposing Maori to schizophrenia. I'm not arguing that dope isn't a factor but there is something else as well. There is a theory that suggests schizophrenia is caused by a virus which arose hundreds of years ago and swept across Europe. Because Europeans have had centuries of exposure some evolutionary defence has developed. Maori, however, have not had that same length of exposure. It's a possibility they are still more susceptible to schizophrenia for that reason. I cannot believe what I just heard. The Prime Minister is taking questions on NewstalkZB and was attempting to describe to a caller what happens to children after a parent is prosecuted for abuse and faces a prison sentence. (The caller was concerned about what would happen to children after the passage of the Bradford legislation and presumably more parents are prosecuted). She then said not to forget that Sue Bradford had another bill in the wings which would allow mothers to have their children in prison with them for longer which would ensure the bond isn't broken. What?? So now we are going to send child abusers to prison but let them take their victims with them?? How far backwards are we prepared to bend to keep children with their biological mothers?? Is anybody thinking about the kids?? How bad is the situation in this country when the best we can offer a child is being incarcerated with her abusive mother?? Yesterday, scientists suggested that men should take a look at their beer consumption, considering the results of a recent analysis that revealed the presence of female hormones in beer. The theory is that drinking beer makes men turn into women. To test the finding, 100 men were fed 6 pints of beer each. It was then observed that 100% of the men gained weight, talked excessively without making sense, became overly emotional, couldn't drive, failed to think rationally, argued over nothing, and refused to apologize when wrong. John Key said National would not touch Labour's original Working for Families programme, which was targeted at lower-income earners, but there was no reason why higher earners should receive a handout from the state. "It's always been my view that it has never been a well-designed system. It was never the intention of Working for Families to reach so far up the income scale," he said. Ironically it is the lower income workers who get the "hand-out from the state" because they receive more in tax credits than they pay. High income earners get tax credits but are still nett contributors. The language around Working for Families distorts and misleads. Another reason for a fair, unambiguous, transparent flat tax system. Cindy Kiro's performance on John Campbell's show was appalling. To use a hackneyed but useful expression, she played the man instead of the ball. After opening remarks by Dr Robert Larzelere, Kiro launched into an attack on his credentials and his christian beliefs, holding up a periodical in which one of his paper's had been published. She was thuggish and overbearing. If Sue Bradford was watching I don't think she would have been best pleased. Sue has better manners and sense of fairplay. And she has tried hard to persuade people to her viewpoint. If Sue took two steps forward Kiro took three steps back. I know my own children are too old for smacking, as soon I will be the shortest in our household. Even when they were small I seldom used physical chastisement. My husband was even more restrained than I was, but if the “Anti-smacking Bill” had been enacted 18 years ago we would both have been on the wrong side of the law. There would, however, have been little chance of prosecution, because we would have been in the same situation as hundreds of thousands of other parents. The police couldn’t possibly deal with them all and would only act when there was a complaint. The Bill to outlaw smacking currently before Parliament - which repeals Section 59 of the Crimes Act - fails at the most basic test. Laws must be enforceable and routinely enforced - otherwise they are meaningless. I don’t doubt for a moment Sue Bradford’s good intentions in sponsoring the anti-smacking bill. Like many of us, she has long campaigned for initiatives to end the violence done to vulnerable youngsters. But good intentions are not enough. This debate - which has been going on for some time now - has relied on emotion rather than reason, and focused on rules rather than results. There is not one MP in Parliament who condones abuse of children. Each of us wants every Kiwi child to grow up in a loving environment, safe from the abhorrent treatment meted out to the Kahui twins, Lillybing, James Whakaruru – and the list goes on. But there will be more cases, and our natural inclination is to take action. As legislators we are in a powerful situation - we can try to make a difference by changing laws to reflect the sort of society we want for our children. But the laws we make need to be enforceable and regularly enforced. This Bill fails on both these counts, and sadly, it will not save the life of even one child, or stop the abuse of children who are subject to such mistreatment that it’s difficult to even read their life stories, because they are just too distressing. The easy option, taken by many MPs, was to vote in favour of this Bill to show that violence against children is being taken seriously – in the hope that it would change those who victimise our defenceless children, and to clear their consciences. But all we will achieve by repealing Section 59 is to turn loving parents into criminals. In the course of doing so, we will make no difference to the real problems. Caring for those who cannot defend themselves is one of the finest things about our civilisation. But the unintended result of the smacking ban will be to criminalise thousands, hundreds of thousands, of good parents. The original version of the Bill outlawed any form of physical punishment or restraint. It made even the lightest uninvited but deliberate touch punishable by law. Holding your child still while dressing them would have made parents into criminals. The current version, still before Parliament, does little better. I don’t need to be persuaded that it is essential to reduce our level of family violence. Violence is a plague that haunts our New Zealand communities and I agree that violence begets violence. But this Bill is not the answer to stopping child abuse. Our existing law against child abuse is already strong. Section 194 of the Crimes Act - Assaulting a child under 14 - attracts a maximum sentence double that of common assault. Section 195 - Cruelty to a child - brings a 5 year maximum sentence, and abandoning a child under 6 means a 7-year prison term, under Section 154. Enforcement of the law is the key. Enforcement involves doing three things properly – reporting the behaviour, trial, and conviction followed by sentencing. If any one of these three elements fails, criminals will go free. The police are struggling to cope already. CYF are struggling to cope. Most abuse is not reported to authorities until severe damage has been done to young lives. Around 70 per cent of serious abuse occurs to children not already known to CYF. Much of this debate rests on the difference between 'smacking' and violence. Proponents of the Bill believe these are the same, but as a parent, I believe they are not. Reasonable people know when discipline ends and abuse begins. The rest – an abusive minority – will not notice, or care, that a law change has been made. The threat that this Bill is intended to be will get ignored by the very people who should heed the warning. Those parents who care for their children already and take their responsibilities seriously will be the only ones who suffer. The greatest good can be done by helping vulnerable families directly. There are already many successful initiatives operating around the country. Mentoring, going into homes and providing advice and assistance with parenting, health, education and welfare issues, will do much more to keep children safe. Plunket is perhaps the best example of mentoring already in action, but they are constrained by funding. ACT will continue to oppose this Bill, but not because we don’t care for children. We simply want caring parents to be able to make the best decisions for their children – decisions that we as legislators cannot anticipate or control from our comfortable parliamentary chairs. Acts of abuse are already illegal - unfortunately enforcement of the law is frequently totally inadequate. This Bill will not change any of that, but it will succeed in criminalising acts of parenting. The website of the book The Welfare State We're In has become available again. Here author, James Bartholomew, describes how he went to hear Charles Murray speak and what he thinks of the idea to replace the welfare state with a payment of $10,000 to each US citizen. A "compromise" idea. If it was this or the status quo, no other option, would you vote for it? "Our people did not hit their tamariki. That only came about through colonisation and through Christianity actually," she said on Marae on Saturday. There is evidence this is right. It may (or may not) be that some school records have been taken as an indication that this was the case throughout the country. But like the other 'new' behaviours colonists brought, drinking alcohol, smoking tobacco (not associated with Christianity) and trading, Maori caught on fast and often went to excess, particularly in the Far North and on the East Coast. Violent by necessity, the alcohol abuse exacerbated that tendency and probably widened the scope of potential victims. As I've said before I can't argue smacking is a good thing but neither has it been proven to cause lasting damaging. But excessive smacking, which evolves into hitting, punching, using implements, burning etc is bad. Some Maori have a particular problem with child abuse but it is usually linked to other behaviours which are already out of control, often despite being illegal. Banning smacking is a little like banning tobacco, another Maori Party policy with no merit. It simply won't work. Some Maori need to grow up. It's no good saying they are perennial children who cannot control themselves so must be banned from every activity that is potentially damaging with excess. Whatever the race, focus on the minority who have addiction and mental health problems. Focus on the perpetrators of real violence instead of casting the net so wide those in real need get lost. Now I have finished mowing the lawns backwards (going forwards results in the catcher falling off repeatedly and much swearing and cursing from myself) I've had a chance to do a little Sunday reading. There is sod-all in the papers to catch my attention but this paper from Colin James about Ruth Richardson is worth a read. You can't please all the people all the time. Ruth Richardson never bothered trying. Would we had a few more like her. Ruth Richardson was an ideas politician. And she allowed too little intellectual doubt. She confounded one TINA ("there is no alternative"), the undoubted need to deregulate and rely more on the market, with another, that there is only one true set of policies, which is demonstrably untrue. She applied a lawyer's logic to abstract economic rules and then advocated them with the intensity of a courtroom lawyer who allows no doubt about his or her case. She knew best. Actually, the electorate knows best. But Ruth Richardson did what she did for what she saw as a greater good. She applied principle when it was sure to cause pain, which took at the very least bone-headed determination but also considerable courage. There were threats to her person. There are not many politicians with spines and carapaces like hers and every now and one comes in handy, if for no other reason than to sharpen the debate. Jim Bolger fired Ruth Richardson after his sorry electoral experiences in 1993. But had he not hired her in the first place, the economic gains and the fiscal improvement which paid off after his sacking might well have been compromised. I think Jim Bolger instinctively felt that and that is why we got Ruth Richardson. The irony is that Helen Clark was the beneficiary.